The ever-awesome Mr. Joo Seong-Ha began running a series about "journalism" in North Korea, particularly with respect to the official newspaper, Rodong Shinmun. Below is the translation. In North Korea, journalists are usually depicted as the party's "trumpeteer," holding down the forefront of the ideological battle line -- because it is the media and the journalists who work for it that are directly in charge of the brainwashing education, such as deification of Kim Jong-Il's family line or popular propaganda, which forms a significant pillar for maintaining the North Korean system. One can glean the importance that North Korea places on ideology from the definition of the "Strong and Prosperous Nation" [강성대국], which it had been working to achieve for the last decade. North Korea's definition of a "Strong and Prosperous Nation" is a nation that achieved ideological strength, military strength and economic strength. North Korea argues that it already achieved ideological strength and military strength. Therefore, it has achieved the status of a Strong and Prosperous Nation as soon as the economy revives enough to achieve the economic strength. The Strong and Prosperous Nation theory appeared in 1998, and there was a controversy at that time also. I was still living in North Korea at the time. The North Korean people quietly spoke among themselves: "It makes sense to talk about economic or military strength, but ideological strength is some kind of a wordplay." At any rate, the fact that ideological strength comes first in the definition of a Strong and Prosperous Nation is a great example of how much North Korea values ideology. Fittingly, the organization of Rodong Shinmun is rather unique. Rodong Shinmun has 15 departments: editorial, party history education, revolution education, party life [TK: not that kind of "party"], popular front, industry, agriculture, society/culture, science/education, South Korea, foreign cooperation, international, reporting, photo reporting, and foreign correspondents. Among them, four departments -- party history education, revolution education, party life and popular front -- serve the role of politics department in a typical South Korean newspaper. This shows how much North Korea values ideological propaganda. In a South Korean newspaper, society department usually takes up the most number of journalists. Sports also have a large place, as there are separate sports newspapers and broadcast media has separate sports news programs. But in Rodong Shinmun, there are no separate departments for society, culture or sports. Among the 15 departments, society/culture department handles society, culture and sports. Other North Korean newspapers follow a similar pattern. This organization is closely related to the way Rodong Shinmun publishes its papers. 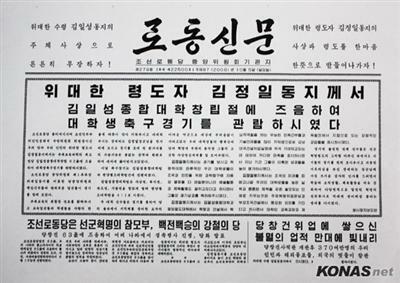 Rodong Shinmun prints six pages, organized as following: the front page carries latest news about Kim Jong-Il, deification education, foreign public opinion admiring Kim Jong-Il and editorial. The second page contains stories about the revolutionary heritage, material for educating the labor class and activities of the party workers. The third page also contains stories of Kim Jong-Il's deification and the loyal subjects who followed Kim. The fourth page finally contains short news about the national administration or economic workers, as well as human interest stories, cultural and sporting events. If the North Korean national team loses in an international match, the loss rarely makes the news. The fifth page is for South Korea and the sixth page is for international news. The most important department of Rodong Shinmun is the editorial board. Only the journalists with the greatest ideological readiness and writing prowess are selected for the board. They usually carry the superlative titles like People's Reporter, Distinguished Reporter or Level 1 Reporter. Of course, it is also the case for a South Korean newspaper's editorial board to have excellent, veteran journalists. Rodong Shinmun's editorial board writes the standard arguments for the party's policies, op-ed and editorial, which are the stories on which Kim Jong-Il focuses the most. The stories on the front page of Rodong Shinmun frequently come with a black box around it. The box signifies that Kim Jong-Il read the story and approved it before it went to print. People are required to study such stories. The editorial board is popular because a journalist who writes a good story has a good chance to be promoted to a party officer, if he can grab Kim Jong-Il's attention. In North Korean newspapers, even the editorial carries the name of the writer. Unlike South Korean newspapers that usually print two or three editorials a day, there are many journalists on the editorial board of Rodong Shinmun that cannot even print one or two editorials bearing his name in a year. There are editorials where a choice of a single word took a month. However, there are journalists who are considered even more important than the members of the editorial board -- the journalists who accompany Kim Jong-Il on his field inspections. A South Korean analogue would be a journalist in the politics department whose beat is the Blue House. In North Korea, such reporters are referred to as "The First Reporter." Foreign correspondents are admired in South Korea, but even more so in North Korea where a travel abroad is itself a privilege. North Korea sends out foreign correspondents to countries with which it has amicable relations, such as China, Russia and other countries in the Middle East or Africa. But becoming a foreign correspondent in North Korea is not a meritocracy -- without extraordinary connections, a reporter is better off not even thinking about the possibility. Once abroad, the correspondent constantly focuses on the opportunities to earn dollars, because keeping the person who sent you out happy guarantees the longer stay abroad. South Korean reporters have to propose newsworthy stories in their departments every morning. But in North Korea, the Propaganda Bureau of the Labor Party gives an order to the newspapers and TV stations, and the department chiefs then order the reporters about what to write. For example, when June 25 -- anniversary for Korean War -- draws near, the party would order an "anti-America week." Then the officers of the newspaper make the reporters focus on writing stories that would stoke anti-American sentiments. Such campaign continues year-around, with themes like "honoring our leader" week or "socialist patriotism" week. The North Korean media has more framed "teachings" and "remarks" hanging on the hallways and offices than almost any other place in North Korea. Here, "teachings" are quotes from Kim Il-Sung and "remarks" are quotes from Kim Jong-Il. Some of them are quite revealing, and not commonly seen in any other place: "Be the party's eternal helper, assistant and advisor," "Even if you want to take ten steps, take a single step if the party tells you to take a single step," "Reporters must not breathe on their own accord," etc. In other words, journalists are ordered to be the perfect puppet of the Labor Party. In most countries of the world, the most important virtue for a journalist is the courage and conscience that do not bend to the power. But in North Korea, a journalist equals the Labor Party's propagandist worker. where's the link to the original text? Sounds like good old Soviet Union! Maybe not so good and not that old, but very very similar. By the way, is there going to be a post on free trade with South Korea? Go, Obama! Yes, we can!